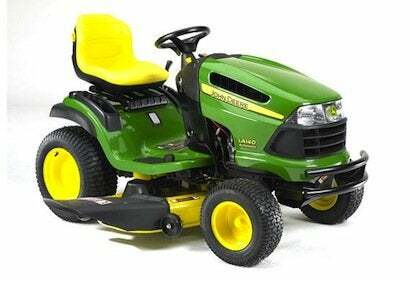 If you’ve got a half-acre or more of lawn to mow, a riding lawnmower or a garden tractor is a great tool to have. Riding lawnmowers cost less and can make quick work of up to an acre of lawn. If you’ve got more ground to cover or you’ll be using attachments like a plow or dozer blade, snowthrower, leaf catcher or tiller, you need the heavier frame and transmission of a garden tractor. Prices for these can range from a thousand bucks for a 14 horsepower model, up to three or four thousand dollars for the 27 horsepower models. Shop around because prices can vary greatly and sometimes dealers will compete or negotiate, especially off-season and when new models are coming in. For yards with lots of obstacles, you need an automatic transmission, or pedal drive model. Make sure the model you buy will easily accommodate the attachments you want to buy now or add later.